Author’s Note: First, TheAthletic.Com is a paid subscription site (I am a subscriber) and is terrific. I’m not sure if the link gives you full access to it without signing up but you’ll have to click on it to find out. This article appears on the site and is a GREAT read. Hope you enjoy it as much as I did. JACKSONVILLE,​ Fla.​ —​ Paul​ Westhead​ listens intently​ over​ the phone​ as​ he’s told for​ the first​ time​ that his​ famed​ basketball​​ doctrine — the fast-paced, run-and-gun, full-court-press philosophy he refers to simply as “The System” — has propelled a college women’s lacrosse team in northeast Florida to national prominence. “I’m intrigued,” the 80-year-old coach says with a chuckle. 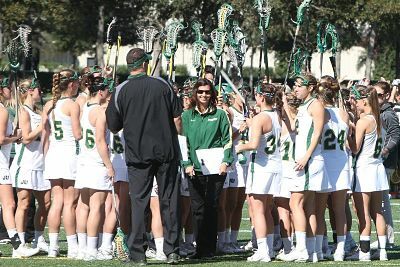 It’s hard not to be: The coaching duo of Jacksonville University’s women’s lacrosse team, a wife-husband pairing, credits a documentary about Westhead’s methods at Loyola Marymount University as the direct inspiration for their success. They’ve taken The System and tailored it to the lacrosse field, even enlisting one of his most famous former players in their tireless efforts. More than three decades ago, Westhead arrived at Loyola with his career at a crossroads. He was just five years removed from winning an NBA championship with Magic Johnson, Kareem Abdul-Jabbar and the Lakers. But after that title season, he had been run out of town by Jerry Buss when the Hall of Fame owner decided Pat Riley, an assistant under Westhead, was the best man to lead his franchise into the 1980s. PrevImmokalee 2019 Raul Soliz Commits to Alderson Broaddus University!